This mint pesto recipe is simplicity itself. Pesto is merely an italian word for pounding or crushing - this pesto recipe is made in a food processor. It is different to a 'coulis' in that it's normally savoury and served hot. Chopped mint blackens quite quickly, so don't prepare this pesto too much in advance. It's OK to make it just as you begin to cook your pasta, but don't do it any earlier than that. 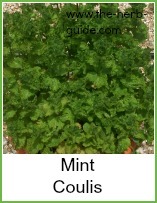 Blend together the mint and cheeses - use a food processor or a stick blender if you prefer. Season to taste with fresh ground black pepper. Boil the pasta according to the instructions and for the last 3 minutes of cooking, drop in the chopped asparagus. Take 4 tablespoons of cooking liquid out of the pan and reserve. Then drain the pasta and asparagus. Return it to the pan with the reserved cooking liquid and the mint pesto. The reserved pasta cooking water slackens off the mint pesto so it will coat the spaghetti more easily. Stir it in quickly so it doesn't lose to much heat, divide between four plates and serve with some more grated parmesan. 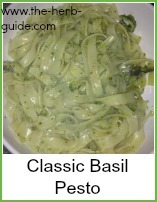 It's a refreshing change from basil pesto and is good mixed into hot cooked pasta. This recipe does not use oil - you are using ricotta which gives a lighter taste. 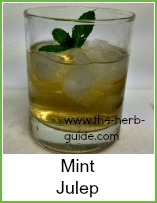 It will not keep as long as one made with olive oil - however, as the mint will blacken, you won't be able to make this up in advance. It is a super quick meal though - you make the pesto while the pasta is cooking - and hey p(r)esto!! a meal on the table in around 10 minutes! 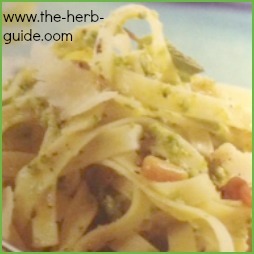 Superb mint pesto recipe that is very easy to make.. Gorgeous with some hot pasta.